If you’ve already come across our ThinkOut cash flow management platform, surely you’ve noticed, above the cash plan chart, several tabs which set the way you view and manage the cash plan: Account, Currency and View by. These filters allow you to make detailed entries for an accurate track and forecast of the cash flow. In this previous article, we explained why it is so necessary to keep evidence of the cash movements in all the company’s accounts. Here we’ll go into more detail about how to do that with the help of ThinkOut, namely the Account and Currency filters. High chances are that your business operates with more than one cash or bank account. To keep track of the transactions, managers usually use the bank account statements, but these are separate documents that don’t offer an overall picture. Plus, each time you want to look at the transactions history you need to check each of the accounts. 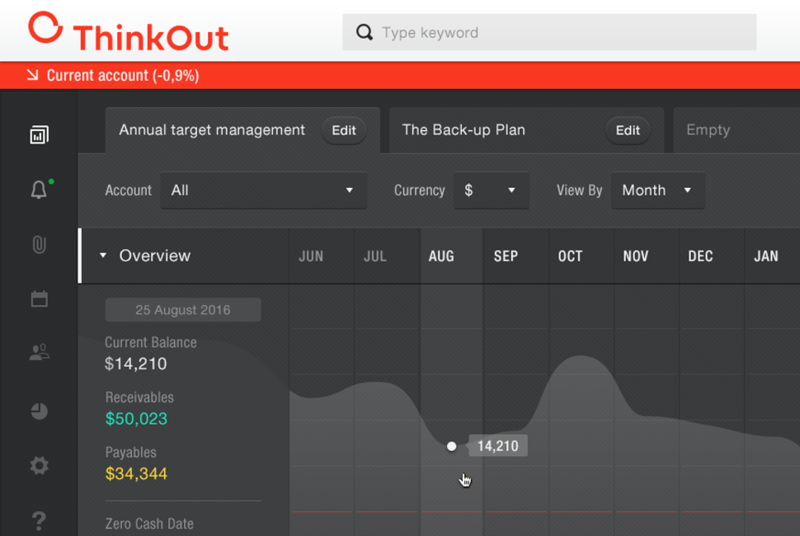 This is where ThinkOut gets very handy: you can keep track of cash operations for as many accounts as your company uses (as long as you add them in the Settings section). By constantly entering the transactions for each account, you get an overall view of the cash dynamic (both in numbers and through the chart line. You can choose to visualize the accounts separately or the totaled values of all the accounts you entered, by day/week/month (your choice of in-depth view). In short, in one cash plan, you can view transactions (income and payments) either by account (the ones that you set) or the total values from all the accounts for each day, month or week. To keep the information as accurate and, of course, useful as possible, it is mandatory to maintain the entries up to date. Which shouldn’t get much of your time, especially if you delegate this task to your teammates (by inviting them to ThinkOut). The second filter is Currency. As expected, most businesses cash in and make payments in more than one currency. To make it easier to monitor, ThinkOut gives the possibility to enter the exact values as they were or are going to be operated in a particular coin. All you need to do is set the currency (from Settings -> Cash Plan -> Currency), then choose the one for the values to be entered in the cash plan. All the other values that were entered in a different currency will be synchronized to the current one. We believe that more control you have on tracking and forecasting the cash movements, the more clarity you gain to support the business decisions.